After early season racing in Australia and Qatar, the European season gets into full swing this weekend with the GP Costa degli Etruschi in Italy and the Challenge Mallorca in Spain. Alessandro Petacchi (Milram) is the favourite for a fourth successive win in the Etruschi race. World champion Paolo Bettini (Quick Step) and Damiano Cunego (Lampre) also make their season debut in the race but Petacchi?s biggest rival could be Australia?s Baden Cooke who will have Britain?s Steve Cummings as part of the Team Barloworld lead-out train. Spain?s Alejandro Valverde will lead the Caisse d?Epargne in the Challenge Mallorca with Tour de France winner Alberto Contador also set to make his race debut in Astana colours during the five-race series. The Tour of Langkawi starts in Malayisa on Saturday with a 182km road stage that is likely to favour sprinters such as Alberto Loddo (Tinkoff) and Britain?s Jeremy Hunt (Credit Agricole). The replacement of the Ghentling Highlands stage is set to make the Tour of Langkawi a much closer race, with the overall winner decided on the final stage on February 17. The season has already started in France, with Belgium?s Jan Kuyckx (Landbouwkrediet) is the early leader of the Etoile des Besseges stage race after two of the five stages. The European action continues next week with further races of the Challenge Mallorca, the Giro di Calabria in Italy and the Tour of the Mediteranian that starts in the South of France on Wednesday. Mark Cavendish and Bradley Wiggins make their season debut with Team High Road at the Tour of California that starts on Sunday with a short prologue time trial. Team High road are currently training in California and the team is set to make the USA the team?s official home and register in the USA. While sponsored by T-Mobile the team was always registered and based in Germany but following their sudden withdrawl, team manager Bob Stapleton has decided to register the team in the USA with the team?s offices in his home town of San Luis Obispo. The team?s Service Corse will still be in Bonn but it seems the move will help the team financially and as they search for a new main sponsor for 2009. The change will mean the USA now has two major teams in the peloton. Both Slipstream and High Road are without major sponsors but include some of the best riders in the world. In a statement High Road said: “We are an International team and proud of it. We are open to committed athletes from wherever they come from. One of the simple pleasures of this team is the international diversity and personal character each athlete brings to the team,” team manager Bob Stapleton said. HIGH ROAD IN THE GIRO AFTER ALL? After the shocking news that several ProTour squads had been left out of the 2008 Giro d’Italia start list by race organisers, it looks like Team High Road (formerly T-Mobile) may be offered a wildcard place after all. However, Giro director Angelo Zomegnan has stated that Astana will not be in the race despite receiving a ‘begging’ letter from Astana manager Johan Bruyneel. Union Cycliste Internationale boss Pat McQuaid spoke out against Grand Tour organisers in a frank interview with CW this week. Referring to the Giro’s exclusion of several ProTour squads from this year’s event and the rumour that Tour de France organisers ASO will follow, McQuaid said: ?ASO don’t follow the rules. Now it’s ASO’s choice: They either follow the rules of the UCI or get out of the UCI. One or the other.? The power struggle over which teams are invited to the major stage races looks to continue in the next few days after the nine of the leading ProTour teams threatened to boycott the Tour de France if they are not invited. Following a meeting in Geneva on Wednesday, the Astana, Team High Road, Rabobank, Milram, CSC, Quickstep, Lampre, Liquigas and Saunier Duval seem determined to put pressure on the Tour organisers but have also called for a meeting to resolve the dispute. “We’re going to talk to the bosses of the Grand Tours to come to a solution. The teams need to know where they’re at.” Henri van der Aat, Rabobank’s interim manager said. Alberto Contador has admitted that he has a ?plan B? if his team, Astana, is excluded from the Tour de France line-up. The 2007 Tour winner says he would race the Olympic Games and the Tour of Spain instead. Contador has argued that as a former winner, he should automatically be included, but ?it?s not up to me to make that decision.? US President George W Bush has asked the US Senate to ratify the International Convention Against Doping in Sport, the international anti-doping treaty created by WADA and adopted by UNESCO in 2005. The move is apparently in response to the 2009 draft of the WADA anti-doping code that restricts the selection of Olympic host cities to those countries who have signed up to the convention. ?The United States supported the development of the Convention as a means to ensure equitable and effective application and promotion of anti-doping controls in international competition,? Bush said. Leading US sports such as Baseball have been struck by major doping scandals in recent years however adoption of the convention would only affect athletes who compete in Olympic sanction sports. Just when we thought that Britain’s capital was getting a joined-up transport policy, along comes the Crossrail project shoving a big greasy spanner in the spokes. Crossrail is the proposed new underground, cross-London rail link – fine in itself – but proposals have already stated that bikes will be banned on the trains and that there isn’t even going to be any cycle parking at any of the Crossrail stations. Now that’s progress. 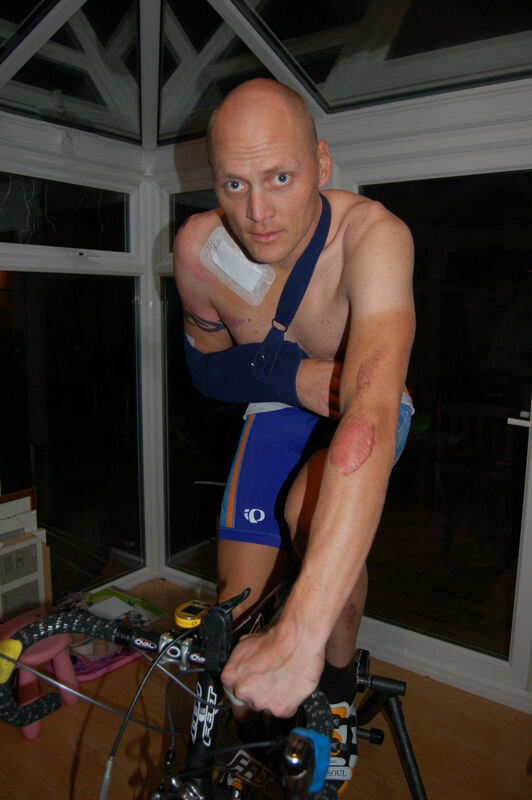 Magnus Backstedt, the Welsh-dwelling Swedish Paris-Roubaix winner, is on the road (well, rollers) to recovery after breaking his collarbone in a crash at the Tour of Qatar. He aims to get himself back in shape and be on the startline for Paris-Roubaix for Team Slipstream-Chipotle on April 13. Chris Birch (East Street Cycles.com) won both events in the GS Stella Sporting time trial weekend on Saturday and Sunday, bagging himself £250 in the process. The GS Stella event in West Sussex has signalled the start of the 2008 time trial season, and Birch has set himself up as the man to beat. Entries for the much anticipated Shimano 24 – the UK’s first 24-hour road race – opened last Friday. You can download an entry form from our website on the link below. There’s space for just 250 five-rider teams, so it’s going to be a race just to get into the event. Last year’s spectacular Eroica pro race – run on dusty dirt roads in Tuscany in conjunction with the mass-participation Eroica cyclo-sportive – was such a success that the organisers have made it an event in its own right. Pro riders Paolo Bettini, Alessandro Ballan, Daniele Bennati and Filippo Pozzato have already said they’ll be there on March 8. Former England footballer Graeme Le Saux took part in his first cyclo-cross race at Dunsford Park, London, on Sunday. Despite finding it hard work, Le Saux later said that he’d enjoyed it, although he didn’t have any long-term plans to give Roger Hammond a run for his money in the CX National Champs. Dan Fleeman has joined former DFL/Pedaltech team-mate Dan Lloyd at the Sean Kelly Cycling Academy squad. Both riders – and all of their former team-mates – were left high and dry at the end of last year after the implosion of the Pedaltech-cyclingnews.com team.